Whether we’re going on a road trip with our family, or simply camping in the woods with a few friends, we tend to get hungry in the wilderness. There are quite a few solutions for hunger in remote places, but not many are as tasty as homemade food. This represents a major issue for passionate campers and the like unless they decide to waddle around with a giant grill on their back. How convenient would it be if you could take your grill with you while needing very little room for it in your backpack? The Portable Grill2Go Infrared Gas Grill makes this option available to everyone. It is way smaller than a classic grill, it requires no electricity and it’s super easy to use. With the Infrared Grill2Go, you can provide yourself and those around you with a delicious meal in the middle of nowhere, through the press of a single button. The lightweight tabletop weighs less than 20 pounds and has an impressive cooking surface of 200 sq inch. It comes with a slotted tool to scrape clean the grate. The stainless steel body makes it possible to clean anything with just a few back and forth strokes. With this much convenience on offer, Grill2go is a good choice. Who says you need to wait for the charcoal to get hot so it could heat the metal that fries your meat? With Grill2Go by your side, you can wave goodbye to impatient foot tapping next to your grill while you’re waiting for the meat to start sizzling. Simply press the ignition button and it will be ready within minutes. Sick of moving everything to the hottest spot once it’s freed up? There is no hottest spot on the Grill2Go, they’re all hottest. 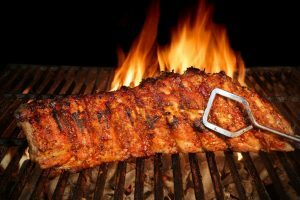 The infrared technology allows for the flow of the heat to equally impact the entire grilling surface. You can be absolutely sure about that veal on the far left being just as done as the chicken in the middle. Grill2Go provides natural heat with its infrared technology, which penetrates and grills the meat instead of frying it on the surface. 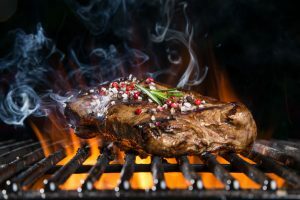 The majority of grills will dry up your food and burn out most of its natural properties. You can preserve the entire original taste with Grill2Go, which can rarely be expected from any type of grill. Outdoor journeys tend to be quite bumpy. This grill was designed in a way that lets every mountain climber and rafter go about their hobby carelessly. Its frame is made of stainless steel, meaning you can even throw it into a wall on purpose and it will be just fine. Even the ignition button is hidden under the front legs for extra protection. Grill2Go is most definitely made to last. Grill2Go can fit in almost any bag, although you will get one for that specific purpose with your purchase. It’s no larger than a puffy pillow and it’s perfect for those who can’t carry much and still want to have a great time. This isn’t something you should let your child or wife carry since it’s quite heavy due to the sheer amount of its contents and the material that it’s made of. Durable metals can be extremely hard to handle when in bulk, so give it a thought before you let any measly adventurer take hold of it. The Grill2Go works on gas, which is quite self-explanatory. When you run out of gas, the barbecue is over. You can always use the one refillable gas bottle that comes with it. 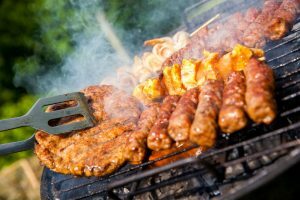 The barbecue isn’t that short itself, but don’t expect to repeat it more than once or twice before you’re out of gas. The Grill2Go Infrared Portable Gas Grill undoubtedly represents a sort of revolution on the market. It belongs to the newest generation of products, those which were designed and enhanced for our leisure by the latest technology. This handy invention features everything a camper would need for a good time: It’s durable, it’s fast, it’s electricity-free and it isn’t bulky. While the electricity and its sheer weight may come to bother certain customers, it’s nothing that can’t be solved with some muscle and an extra gas can. With very few liabilities and a good number of qualities, the Grill2Go Infrared Portable Grill comes out of the review ring as a champion of its category. 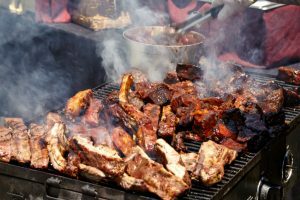 It makes a barbecue on the go sound extremely easy, while it’s usually a way more complicated process. 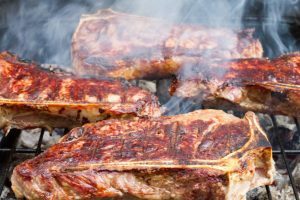 Looking at the fearsome competition of portable infrared grills, slight but important differences can be noted. 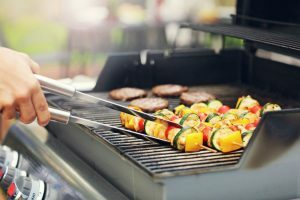 For example, the Patio Bistro Gas Grill offers more cooking space than the Grill2Go (320 square inches, as opposed to 200), but it comes with a set of wheels and it’s quite space-consuming. The customer would need lots of room in their trunk if they were to take this grill on their trip, while the Grill2Go fits on the lap of a 5-year-old. One of Grill2Go’s greatest features are its qualities combined with its low price. The Newport 2 Infrared Gourmet Series Gas Grill offers almost everything that the Grill2Go does, including even a glass pane on the top cover. However, this little luxury comes at a heavy price, which can’t be compared to Grill2Go’s just above hundred dollars pricing. Grill2Go is most definitely the cheapest state-of-the-art portable infrared grill out there. Is Char-Broil Grill2Go worth a buy? 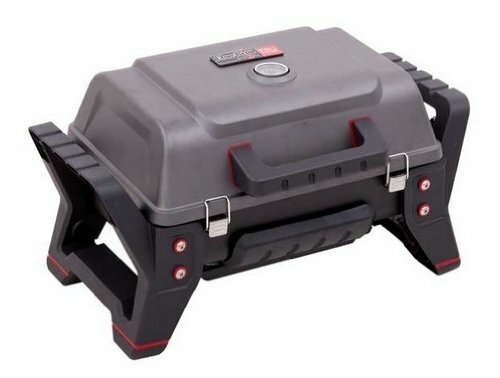 The Grill2Go Infrared Portable Grill is a purchase you won’t regret, especially if you’re a camping aficionado with a developed barbecue taste. 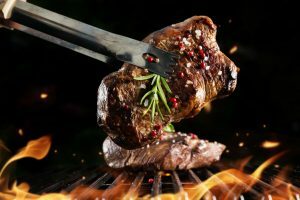 Aside from providing your company with delicious meals literally anywhere, you can rest assured that the meat itself grilled with the highest quality of taste in mind. Grill2Go is as sturdy as they come. It is built to endure even the bumpiest adventures in the wilderness. 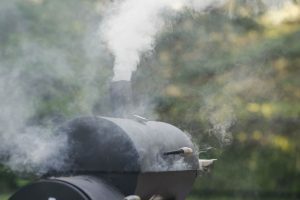 Char-Broil has been in the market since a long time and has always come up with some of the best grill options in different variants and this model is the best in its category. Grill2Go is most often the optimal choice if you are considering a on-the-go infrared grill. It is loaded with features and a 9, 500 BTU burner is the first thing to be mentioned in a long list of features it comes with. 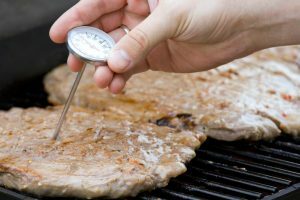 With super easy cleaning options, a large grill surface, die-cast firebox and aluminum lid, heat-resistant handles, durable and a rust-resistant body all offered at one of the cheapest price in the market certainly make it s a good choice to buy.